The Amazon Basin contains the largest tropical rainforest in the world, covering an area almost the size of the continental United States. Most of the basin lies within Brazil, but it also encompasses parts of Bolivia, Colombia, Ecuador, Guyana, Peru, and Venezuela. It is home to an estimated twenty-six million people, including isolated and even uncontacted tribes. 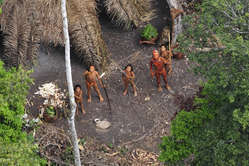 Some have denied the existence of as yet uncontacted tribes, but it has been documented by eye witness reports and by aerial video footage. These uncontacted tribes are resistant and hostile to anyone approaching them. They and their land are currently threatened by mining companies, oil companies, and armed illegal loggers. Any contact with outsiders poses a threat of introducing a disease that can easily wipe out half the tribe; even the common cold is a real danger. For these reasons, the Brazilian government protects indigenous people and their land from intrusion. How can these people for whom Christ died be reached with God’s message? And if a way to get to them is found, how can the spread of disease be prevented? Will we give it up as impossible? Or will we ask the God with whom all things are possible to make a way?